The biologist J.B.S. Haldane is reputed to have been asked what could be concluded about the nature of god from a study of his creation - his reply was that he has - "An inordinate fondness for beetles." 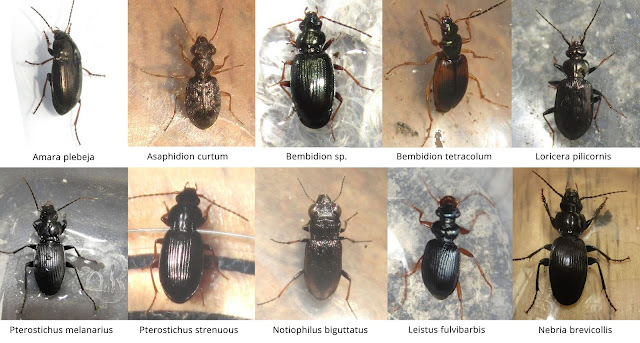 Yes there are a lot of beetle species - nature has got beetles coming out of its ears. I had my own taste of this during my week long 'beetle drive' (fans of pointless stuff your parents used to do should check out the beetle drive). I put a pitfall trap in the garden - this being a glass jar placed into a hole in the ground. Beetles stumble into the trap and can't get out - simple, yet...erm...simple. Almost every time I inspected the trap - I would see one or two ground beetles scurrying around and bumping into each other like tiny dogem cars. Black and shiny and all the same - until closer inspection revealed them to be mostly different species - an inordinate fondness indeed. 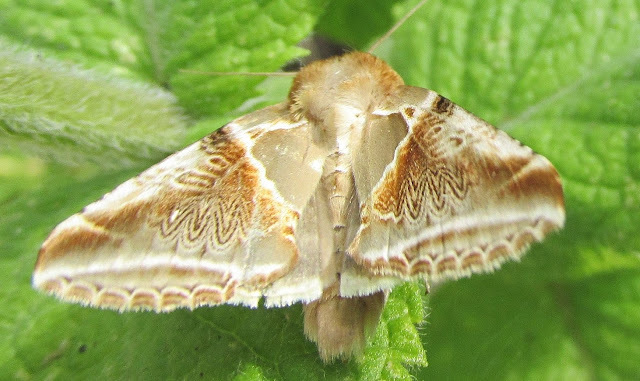 I think the Buff Arches is my favourite moth - it's a moth masterpiece! Even though you know you're looking at a flat wing, the optical illusion is so convincing that you can't help but see it as two surfaces. I like the way that evolution has provided it with a drop shadow, to give the illusion of depth, of the kind you'd produce if you were using photoshop. To see how closely I could mimic the effect I produced the image on the right. Why would coloration like this evolve? It seems clear that breaking up the outline is the 'objective' here. But what about the other markings? Why is it that colour? Why does it have the looped markings, why does it have the line along the wings' trailing edge? Is it possible to ever know? It's sometimes contended that every single marking on a moth or butterfly's wing, every tiny line and dot, must have an adaptive benefit. This may seem hard to believe - surely some of it is purely random?..isn't it?